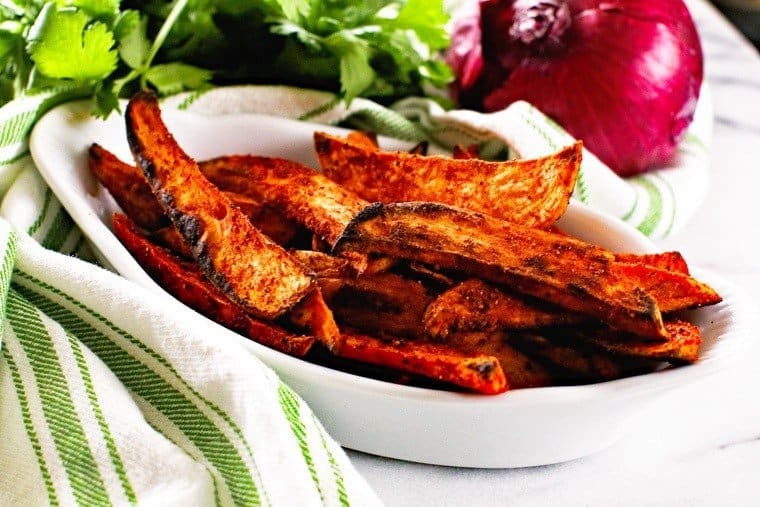 These crispy, Grilled Sweet Potato Wedges have the perfect seasoning on them! I love the crisp edges and the spicy and sweet seasoning on them. Throw them on your grill the next time you grill for the perfect side dish! 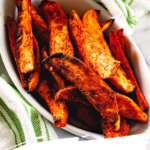 Grab your grill basket and get to work making these delicious Sweet Potato Wedges! I love that fact that these have a delicious spice on that for a little kick but nothing to crazy. Combine that with crispy edges and I’m a gone. Plus, the flavor from grilling them is over the top! I love, love, love finding new side dishes to make on the grill because my goal is to make my ENTIRE meal on the grill if I’m grilling. It’s to hard to manage things in the kitchen while manning the grill too. I even make my desserts on the grill! This is also why I invest in this grill because it’s AMAZING and can handle all of it! First things first… you and your family are going to love these taters!!! The seasoning is super flavorful, but not hot or overpowering so everyone will love them. 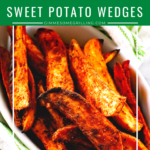 The inside of the grilled sweet potato wedges get super creamy, the edges crisp! Really a delicious side dish! Absolutely! The skins of the potatoes are delicious, just makes sure you scrub the potatoes well before grilling. 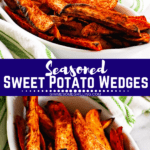 Do you have to peel sweet potato wedges? Nope! It’s your preference. Me I prefer skin-on, I also think they hold together better especially on the grill. 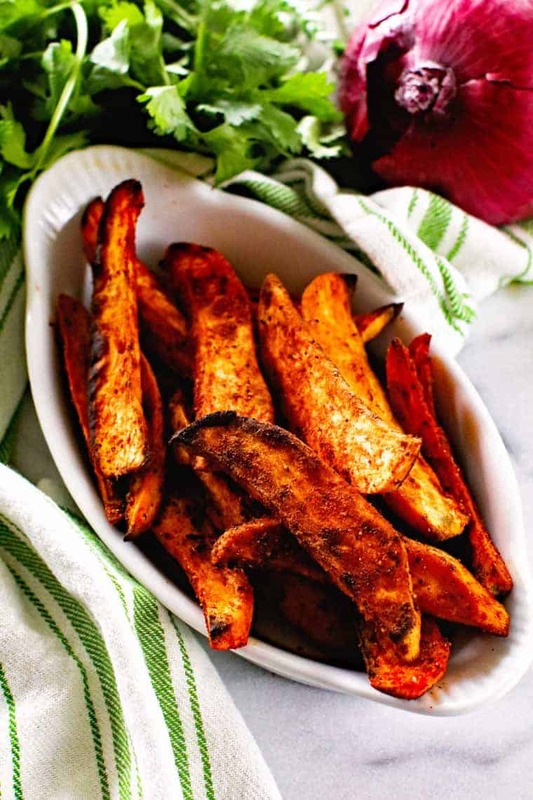 How do you make crispy sweet potato wedges? If you’re looking for a crispy wedge you’ll need to start cornstarch. That’s really the secret to super crispy sweet potatoes. That and double frying in oil. 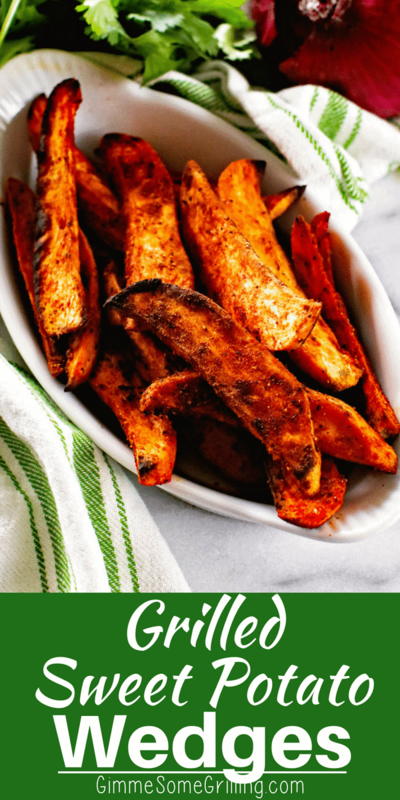 Since we’re making these on the grill these sweet potatoes will have crispy edges and are wonderfully seasoned! 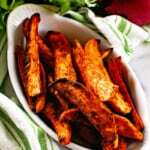 What spices to put on grilled sweet potato wedges? Great question! Sweet potatoes provide a great source of nutrition and though delicious, are more expensive than white potatoes. Both have great nutritional value. I love sweet potatoes, but not just in the fall and winter. 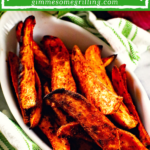 By grilling them we get to enjoy sweet potatoes year round! 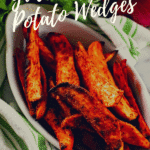 How do you cut a sweet potato into wedges? Start by slicing the end tips off the potato, slice it in half and then into quarters. Cut the sweet potatoes into a uniform size. If they aren’t all about the same size they will not cook evenly. 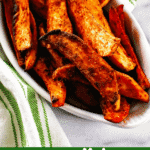 These sweet potato wedges have the perfect seasoning on them! I love the crisp edges and the spicy and sweet seasoning. It’s a great combination! Looking for more great potato recipes? Check these out! Ok, here’s the recipe! Don’t forget if you make this be sure to tag me on Instagram and if you and your kids love these recipes as much as I do, leave a five star rating below! Prepare grill for direct cooking over medium heat (350 - 400 degrees F). Place perforated grill pan on grill to preheat. Combine all ingredients except sweet potatoes in medium sized bowl. Scrub potatoes under cold water and then dry them with paper towels. Cut the potatoes into 4'' x 1/2'' x 1/2'' sticks. Place in bowl with seasoning, drizzle olive oil over them and toss to combine. 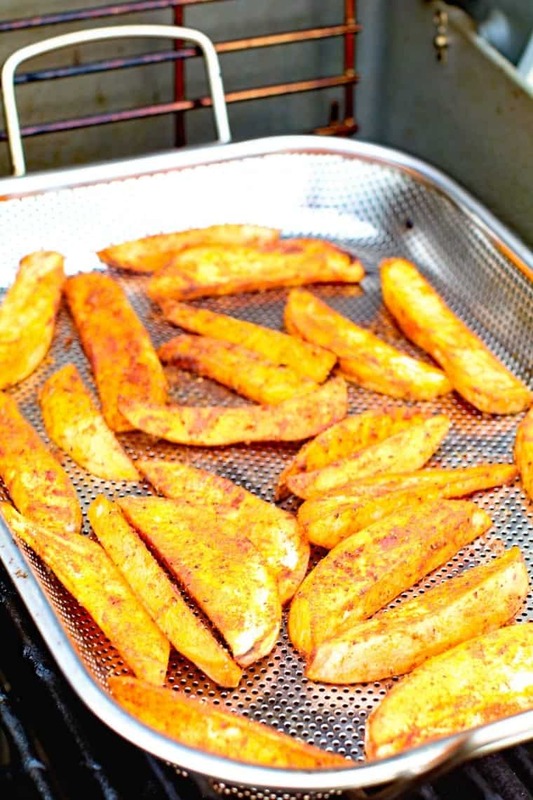 Spread the potatoes in a single layer on the grill pan and grill over direct medium heat, with lid closed until they are tender when pierced with a knife. This should take about 12 -15 minutes, turning occasionally to brown on all sides. Hi Jason & Julie! These look amazing. Thanks so much for sharing our recipe as well. Hope you’re having lots of fun grilling this Summer! Thank you for letting us!